Hunter air cleaners are made by the Hunter company. It was founded back in 1886 to sell ceiling fans. These first fans were water powered. They were truly innovative and unique for the time period. Today Hunter still has the same innovative spirit. They manufacture ceiling fans, thermostats, humidifiers, and air purifiers. They have been making air purifiers since the mid 1990s. The line of Hunter air purifiers include the QuietFlo, HEPATech, and Permatech product lines. Hunter currently produces 5 QuietFlo models. There are several older models still available. The replacement Hunter air filters and pre-filters are still available. Independent test of some Hunter air cleaners showed that 98% of the particles were actually removed. This is not 99.97%, but it is still very good performance. 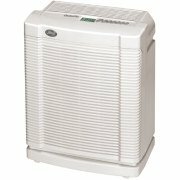 These Hunter HEPA air purifiers use true HEPA filters. These filters can trap and remove 99.97% of particles 0.3 microns in diameter or larger that pass through the filter. Quietflo air purifiers use two Hunter filters. In addition to the HEPA filter, they also have an activated carbon pre-filter. The activated carbon pre-filter is supposed to remove odors from the air. The pre-filters do not have a lot of activated carbon. This means that they are not really going to be very good at removing odors. All Quietflo Hunter air cleaners all have whisper quiet operation. They are quiet on the lowest fan speed. They do tend to be a bit noisy at the higher settings. We have reviewed 5 models. The Quietflo 90 is designed to clean a small room. It would do a great job in a small bedroom or home office. The Quietflo 85 is very similar to the Quietflo 90. It is designed to clean a larger room. This would work well in a living room, dining room, or larger bedroom. This model will clean a space a little smaller than the QuietFlo 85. It would still work well in a living room, den, or master bedroom. This model offer the same cleaning technology with electronic controls. The QuietFlo 401 covers the biggest space. This will work well in any room of your house. Provided your rooms are not huge. Similar to the the 401 model, this model also cleans large rooms. It uses electronic controls and is programmable. Leave Hunter Air Cleaners and Return to All About Air Purifiers Home Page.